Are You A Victim of Excessive Daytime Sleepiness? The Skeptical Cardiologist has been analyzing the data on sleep apnea (OSA) and cardiovascular disease, utilizing his spectacular skeptical skills. Recent guidelines from the American Academy of Sleep Medicine suggest that 30 million adults in the US have OSA and that OSA is causing all manner of problems. I note patient awareness of the possibility of OSA is rising exponentially and many of my patient’s are being subjected to sleep studies because their wives are bothered by their excessive snoring. Although I have no reason to suspect that I have sleep disordered breathing (SDB-I feel like this term is becoming popular as it avoids the stigma of apnea), I decided to determine my Epworth Sleepiness Scale which is often utilized to measure excessive daytime sleepiness. Johns (2002) introduced the term somnificity to describe the effects of different postures and activities on sleep propensity. The somnificity of any particular posture, activity and situation is a measure of its ability to facilitate or impede sleep onset in the majority of people. It is not a characteristic of individual people or their sleep disorders. Simply to lie down rather than stand up increases one’s likelihood of falling asleep – the change of posture increases one’s sleep propensity at the time. 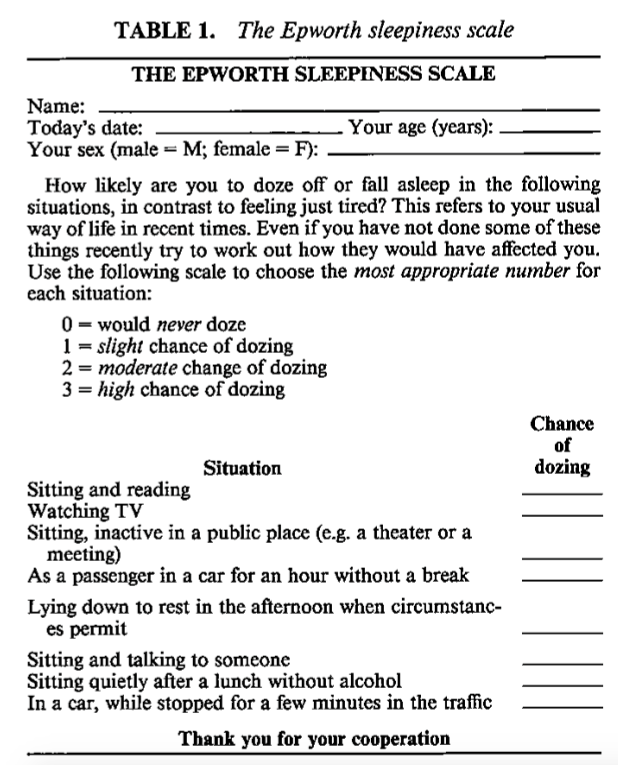 This self-administered questionnaire asks you to rate how likely you are (on a scale of 0=never to 3=high chance of dozing) to doze off or fall asleep in certain situations. What follows are the situations with my observations and my self-rated score. They don’t ask about falling asleep while driving which seems much more important than the other situations. I’ve done that a lot. The biggest soporific situation for me is sitting in a barber’s chair. No matter what small talk the hairdresser throws at me, I am asleep within 5 minutes. My bobbing head requires the rare skill of trimming a moving target. My total score was 12 which puts me solidly in the land of sleep disordered breathing. In the original study by Johns the patient’s with sleep apnea (OSA-line 3 in below chart) had an average score of 11.7. The AASM guidelines indicate that I could have gotten into some OSA studies with my score, especially if I add in that I have been caught snoring, gasping and choking (sometimes all three simultaneously!) and I have hypertension. The Eternal fiancée got a respectable score of 7. Apparently she never falls asleep at traffic lights, watching TV/movie or sitting after lunch and believes these are masculine traits. However, I think she should get double points for taking long, intentional naps throughout the day. i get a 3 (near 100% chance of falling asleep while lying down during the day with no stimulation), but otherwise not. If I get in the recliner after work, late afternoon or early afternoon, I set my phone alarm just in case. This has increased in recent years. In the other circumstances in the quiz almost no chance. Yet I feel like I should be more alert and less tired – this I blame on the thyroidectomy in 1972. Epworth is a very Methodist name. What is the connection? Epworth I believe is the either the hospital or the city in Australia where Murray Johns did his soporific research on somnoficity. Probably 95% of the patients over age 60 complain of feeling less alert and more tired than they used to.